Gwent is a free game with in-game purchases. To get rid of bugs and optimize the gameplay, a beta was introduced, for which you can still register. If you have not played Gwent in The Witcher 3 or have nothing to do with the wizard RPG, that's no problem because in this article you will find some useful tips for getting into the game. The beta will not have a single player campaign. In the finished game you will find a single player, which is about 10 hours of game time. In addition, a skirmish mode is planned, in which a player can play against the AI. But this function will also be integrated into the full version. The board consists of 6 rows - 3 of them belong to your opponent and to you. Your battlefield consists of melee (3rd row from below), ranged (row in the middle), and siege (row all the way down). Use the characters in the rows to determine where you can place which cards. A game consists of 3 rounds - winning 2 of them to emerge as the final winner. Each card shows you which series you can play. It also has a combat value. You must play with the cards you see below. In the second round you can draw 2 cards from the stack, in the third, only one. So your cards should be holy to you. If you have more points than your opponent in the end, you win the round. The number of points you see to the left of your cards. - Plan your moves! Especially strong cards you should pick up. If you have already won the first round, you should not win the second round. If you don’t draw good cards, it can take a lot to wait and play all the good cards. Then the third round belongs to you. 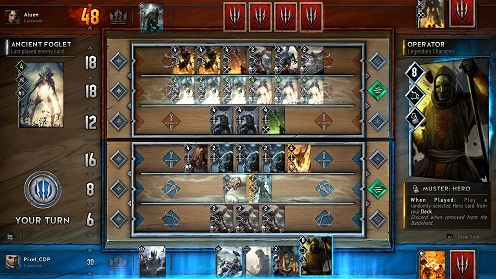 - Bluffing plays an important role in Gwent. Play weak cards first to see how your opponent reacts. Analyze his style to react. Of course, this is one thing that comes with the time and player experience. Of course, you want to show your opponent that you have strong cards like Geralt in your deck - but let it rather be and raise it for later rounds. If the opponent plays a hero card directly in the first round, you should unpack defensive cards and win him. For the next rounds the victory is safe, since the opponent has already consumed his strongest card. - Keep your deck small! Because then the chance that you draw strong cards is bigger. It also packs cards that perform various functions and whose effects fit many other cards. This allows you to change your strategy depending on the opponent's style in the middle of a round. - Focus first on only 2 rows! You should follow this tip when your weather charts are playing. If you want to use fog, for example, your range should not be occupied. So you can weaken the row of the opponent, since the effects apply also to him. Try to take a map with you to react to weather effects. As soon as you pull them, you should use them only very late, so that your opponent cannot post an effect. - Provide a wealth of variants and avoid abilities! Special cards can weaken a strength on the entire board. If you take cards that all have ability, the evil can go out and you are gradually weakened. Some special units can retrieve dead cards. It never hurts to take such a card with you.